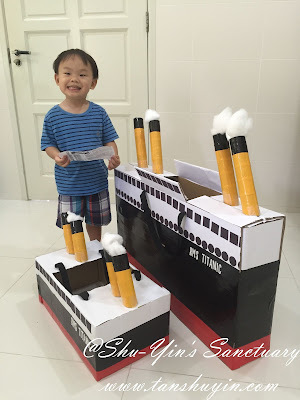 Shu-Yin's Sanctuary: Kids Halloween Costume - The Making of the Titanic Ship! 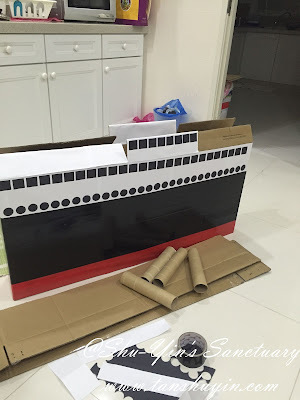 Kids Halloween Costume - The Making of the Titanic Ship! 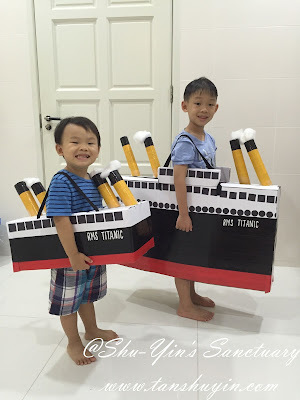 My kids with their Titanic Ship costume! 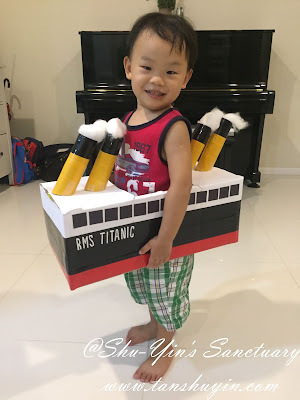 Shern came back to tell me there is going to be a Halloween party for the school, and that he needed a costume. As you all know we weren't fans of ghosts, vampires or skeletons or anything scary. 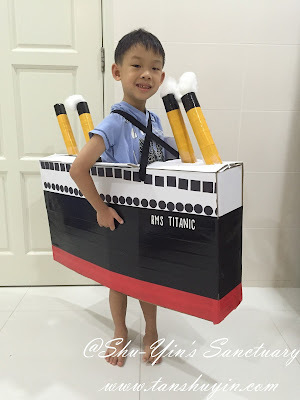 Halloween to my kids is dressing up and collecting candies. 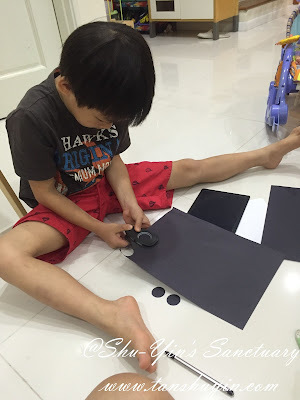 All these while, Shern has never been into superheroes (Iron Man, Superman, Batman, etc) like the other boys his age. Shern likes transports. 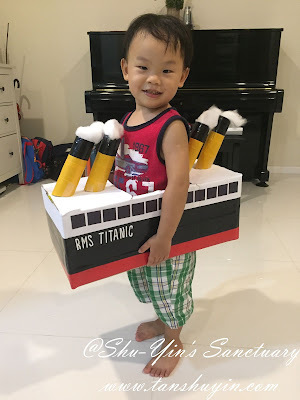 And most available costumes for rent/sale for little boys are superhero costumes, and they can get pretty expensive too which is quite a waste since it is only for worn for a day or so. 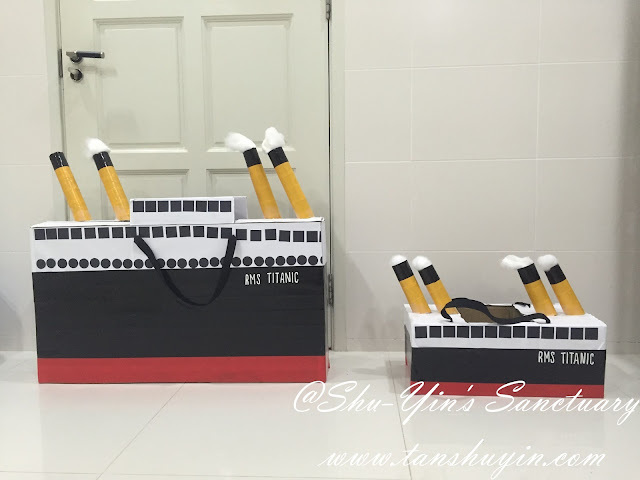 And as you all know, Shern is currently very into the Titanic, view my blog post here, and my latest status update on Facebook. 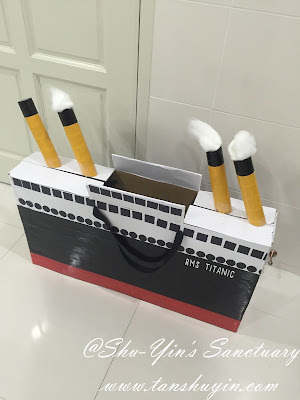 So it was no surprise when Shern came home and told me he wanted a Titanic costume. 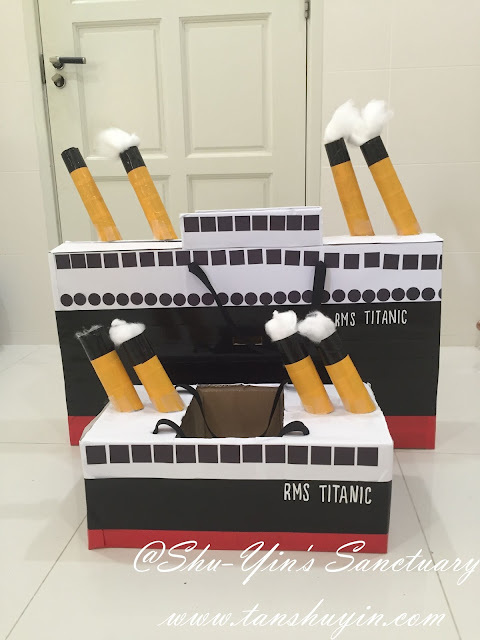 Mine you, it was not about being a captain of the Titanic, but more like being the Titanic ship itself! And Khye of course he wanted what his koko wanted! 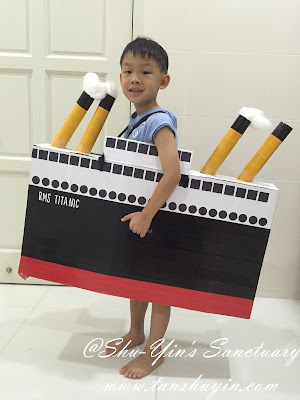 I would be happy if he said he wanted to be Mickey coz it would be easier, but nope, he wanted a Titanic too. 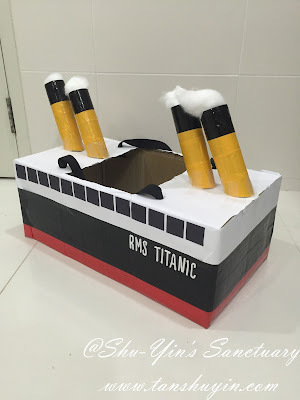 So this was how I needed to make not one, but two Titanic ships for both boys! 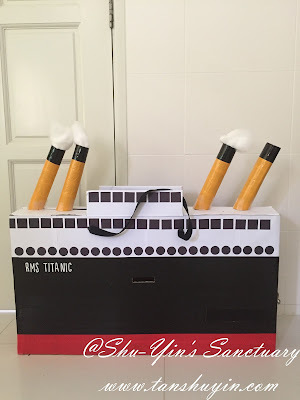 I searched around online and on Pinterest to find an easy-to-do Titanic costume and there were not many. Thank goodness in the end I found this and felt that it was achievable. 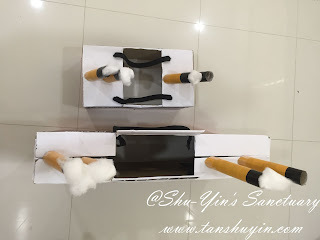 And so I thought about it in my mind on how to do it. 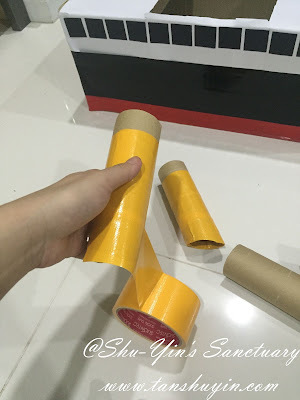 I went to Popular to buy some cloth tapes, black, red, and yellow as I know I will be using these to wrap the box up. Next in search of the correct size box. 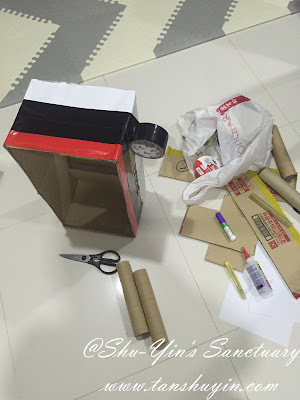 For Khye it was easy because I wanted a small box so that it would not be too heavy for him to carry. As for Shern, he wanted a bigger one. 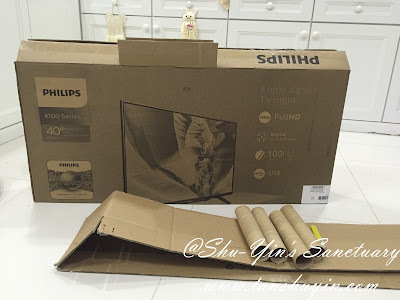 I wanted something flat so a TV box would be good. The problem is where do I find a discarded TV box? 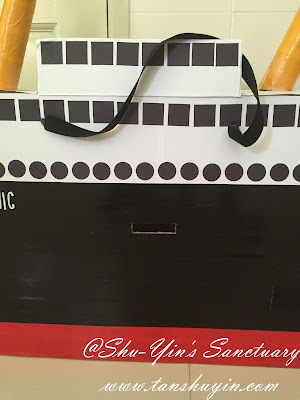 I went to a few electrical shops to get this box. Most shops tell me they didn't have any as most of their boxes are either with goods or discarded away. Luckily there was this nice man in the SEC Electrical shop in Prima Tanjung who said he would keep one for me when he did delivery that day. 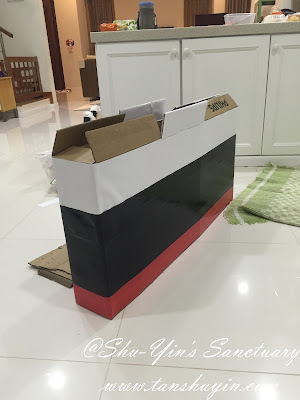 And that was how I got the box for Shern's ship. Firstly, I made Khye's Titanic ship first. 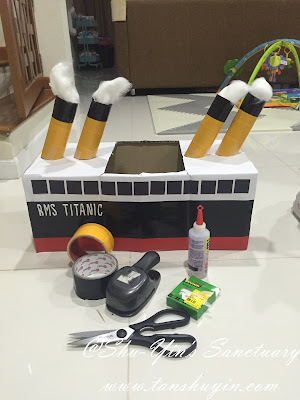 - round punch, scissors, glue, pen knife. 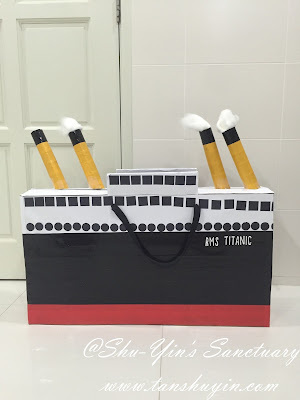 The making of Khye's simple Titanic ship. 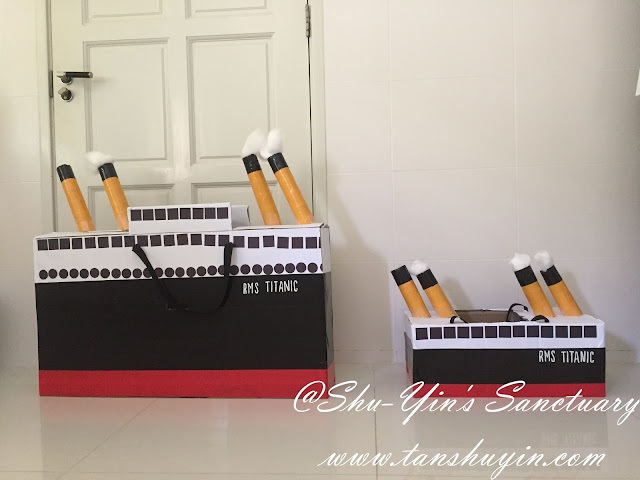 As for Shern's, same materials used but I just added in more windows as Shern wanted more details. In fact, this is the blue print he drew for me. "Mum, I want mine to be like this. 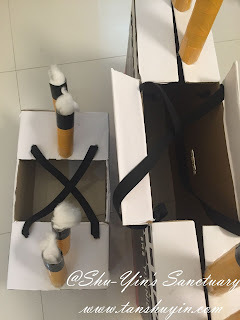 Make sure the funnels/smokestacks are slanted" says Shern. And so, I got to work on his. 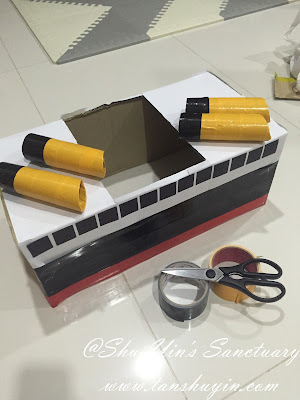 Shern helped of course by punching out the circles for the windows and sticking the square and circle windows onto his ship. As I was doing it just a few days before, I worked on it until 3am 2 nights ago. I was a bit zombi-fied the next morning when I woke up at 6.20am as usual. But it was all worth it when I see the almost-end results. 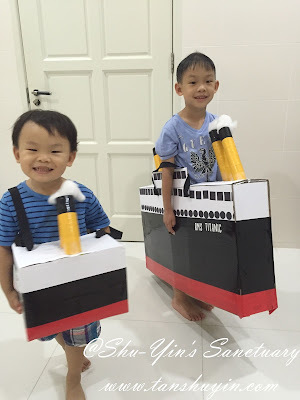 And the happiness on my boys' faces when they tried it on. I then also did some modification on them after they tried it on. 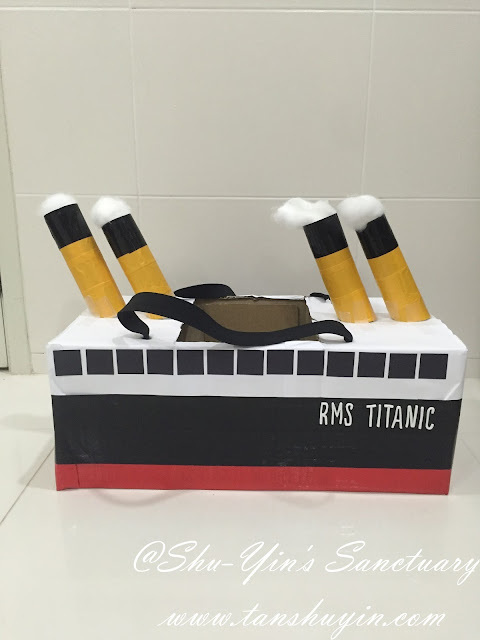 I slit two holes for Shern's Titanic to hold his big ship, one on each side. 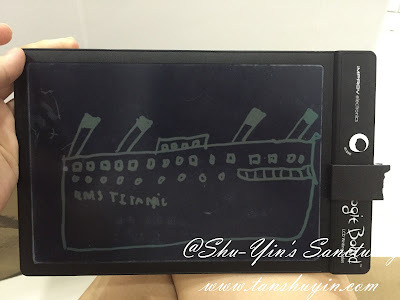 See the hole in the middle of the ship on the black part? I also changed the strap. From a normal straight strap to a crossed strap for more secure hold. I must say I am pretty proud of my work. It looks decent and most important my boys are happy with them. And they are cheap. 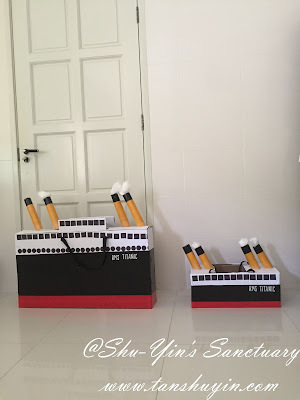 In total I spent about rm20 to make these two, excluding labour costs though. hehe. 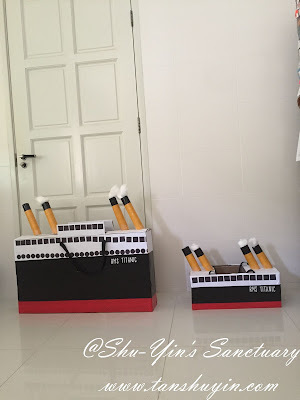 My boys parading in their Titanic ships! 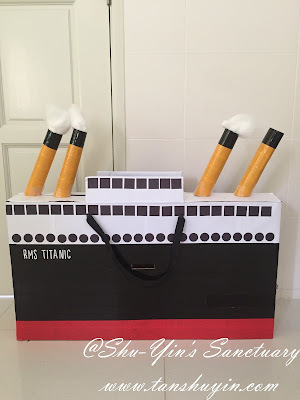 Later on, the boys will be bringing their ships to the party. Hope the ships will last throughout the party. 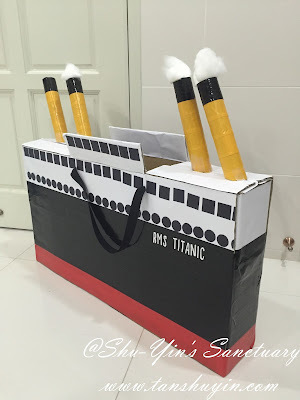 I think I'm bringing some tape and glue there just in case parts of the ship drop out halfway during the party, haha.